If you have a promo code (an alphanumeric code applied to an online order to obtain a special discount), you can apply it on the checkout page. Note: Promo codes can only be applied to Pay online orders. Click on the Shopping Cart from the main menu. Under Payment method, select Pay online. Under Order total, enter your promo code into the promo code field and then click Apply. If valid and entered correctly, the promo code you applied will appear in green text with a check mark below the promo code field. 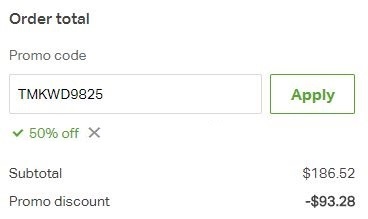 The dollar amount discounted will display below the subtotal and the order total will update. If you would like to remove a promo code that you’ve applied, click the “x” that appears next to the promo code name. The order total will update.